Posted by FormSmarts on Sep 22, 2017 at 6:00 am in payment form. How do I get a copy of the form emailed to the person who filled it out after they make their payment in paypal? Right now, user fills out form, hit submit, goes to a page that says “pay through paypal on next screen” but then they never get a confirmation email. Can I do this? I am a biz customer. 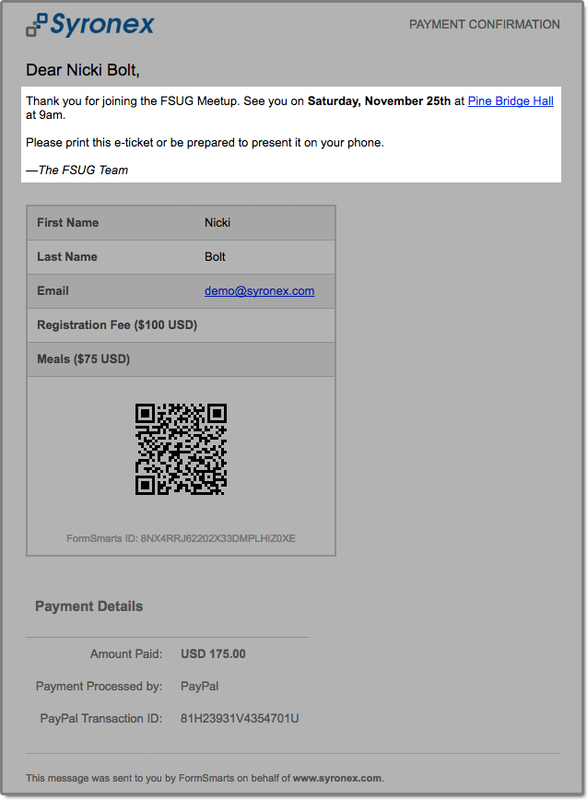 Casey, when a form involves a payment, FormSmarts always sends a confirmation email after the payment is complete. The confirmation message is currently sent to the email address submitted with the payment, which might be different from the one submitted on the form for people who pay with an existing PayPal account under a different email. We’ve planned to start sending confirmation emails to the email address in the form in the coming months. Has the feature to send confirmation emails to the mail address in the form rather than to the person who pays been implemented, yet? Bill: Yes, FormSmarts now sends the confirmation email to the email address provided on the form. We only fall back to the email address associated with the payment if the form has now email fields. If a form has more than one email fields, we use the email address entered in the first one.